Nader began his professional career accompanying world-renowned classical musicians from South Asia during their visits to San Francisco. His first classical concert was with master Pakistani vocalist, the late Ustad Salamat Ali Khan, as well as his virtuoso sons Shafqat, Sharafat and Sukhawat. It was during this period in Salar’s life where he became an official disciple of 2-time Grammy award-winning artist, Zakir Hussain. In this ceremony, the teacher ties a red thread that has been ritually blessed around the student’s hand. This act joins student and teacher for life, and normally comes only after many years of study. Nader was just twelve at the time. From there, Nader began performing onstage with master musicians visiting from India, including the late sarangi virtuoso, Ustad Sultan Khan. 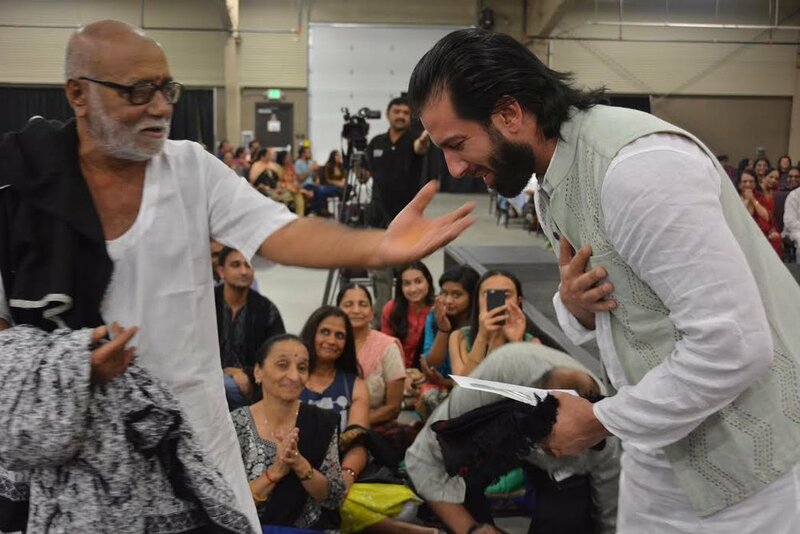 Even as he made his way with the greats of Indian and Pakistani classical music, Nader kept up ties with his ancestral tradition, accompanying Afghan singers whose music is built around Farsi poetry and specialized musical ideas. In 2004 Salar spent six weeks in Mumbai, deepening his study of classical tabla. Every year on February 3rd, artists from all over the world gather in Mumbai, India to pay homage to the late Tabla Maestro, Ustad Allah Rakha. This event proved to be “an eye-opener,” showing Salar just how demanding a deeply informed audience could be. These listeners were not impressed by style and showmanship, but rather content, knowledge of theory and virtuoso execution. “Those six weeks felt like five years,” he recalled. But after that, his guru deemed him ready to begin teaching, and soon Nader had 75 students, including some of the most talented young tabla players in the United States. Nader’s circle continued to expand. He started to get calls to work with Iranian musical masters, including the “Pavarotti of Iran” Shahram Nazeri & son Hafez of the “Rumi Symphony Project”. He became the principle accompanist for Ahmad Wali, the most popular Afghan singer of Farsi ghazal’s from 1960 up to the present. Even master vocalist Ustad Ghulam Ali Khan and Sarode Maestro, Ustad Amjad Ali Khan called on Nader to be part of his North American tours. Since 2007 Salar has been an official Aga Khan Music initiative artist (AKMI). He tours frequently with several of AKMI’s projects which include, “Rainbow” featuring the world renowned Kronos Quartet, “In the Footsteps of Babur” Rahul Sharma, “The Art of Rubab and Tabla” with Homayoun Sakhi. While Salar is a regular performer at AKMI he also a teacher. The Aga Khan trust for culture has several schools worldwide. Salar visits the schools twice a year and makes time for lecture demonstrations and teaching. During these visits he curates and scout’s for some the brightest and youngest artists to come out of Afghanistan & Pakistan. Salar has also been an “Artist in Residance” at the following Universities in the U.S., University of Washington, Seattle, Dartmouth College, Harvard University, M.I.T., Cornell University, and Brandeis University. When Salar is home he makes time to teach privately and gives tabla lessons online. Salar believes strongly in passing down the knowlegde that has been shared by his Guru, Ustad Zakir Hussain. A few years back NY times best-selling author, Khaled Hosseini and Nader collaborated on a stage adaptation of his acclaimed novel, “The Kite Runner”. The production was adapted by Mathew Spangler [San Jose State University] and directed by David Ira Goldstein. Nader, Musical Director, composed and performed the musical score for an initial, two-month run in San Jose in 2007. He then reworked the score, arranging and composing works entirely from the world of Afghan, Pashto folklore and ghazal. Salar’s music for the Kite Runner has been nominated for several awards including, “Outstanding Sound design or Composition” Betty Mitchell awards & “Outstanding Score” 26th Sterling awards. Salar is currently Musical director for the stage adaption of Indu Sunderasan’s, “The Twentieth Wife” by Farah Yasmeen Shaikh. The production had its world premiere at the Z-Space in San Francisco and is set to tour throughout the world in early 2016 & 2017. While living in Hollywood, California Salar enjoys collaborating with celebrated Film and TV composer, Michael Andrews. So far they have joined forces on a couple blockbuster films, such as Paul Fieg’s “The Heat” and Mira Nair’s “Reluctant Fundamentalist”. Salar also composes music for Afghanistan’s TOLO television network. The Afghan network features the most watched TV shows, “Afghan Star” and “The Voice”. When Salar visits Kabul he is regulary featured as a guest judge and performs a tabla solo. Salar is dedicated to the preservation and promotion of the musical traditions he belongs too. While maintaining his traditions, Salar simultaneously weaves the Tabla into today’s Hip-Hop, EDM, and popular musical genres. He hopes to inspire new audiences with universal sound of the Tabla.